@SonicHex No, not really? They different styles. 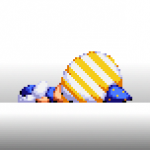 I used the spindash sprites as they're a lot better looking than the Sonic 3 equivalent. At least now we have proper genesis-styled Ray sprites. @Doc 2013. It was made for the hack 'Sonic Classic Heroes', but I'm revamping the sheet. How "very old" is this? Looks awesome. This is, by far, the best Ray spritesheet we have as of now.